It was several weeks before his landlady realised he'd left without paying. © All Rights Reserved pepoexpress - A few million thanks! ...and THIS was the world's first dancing machine: "The Thingama Jig!" How do you get this contraption running? The BBC arse-kicking department gear up for 2015. 1/ Stand Scotman into boots. 2/ Play Jimmy Shand record. 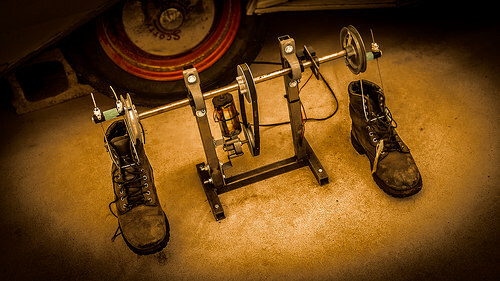 New Army Boot testing machine available in March. "I've got an idea" said Nick Park. Unfortunately, this machine is brogan. It has its own generator, two boot. Prison wardens foil escape attempt by Oscar Pistorius. "Well, my husband said he needed new brake shoes..."